Kafe serves up the kind of healthful food that is so well done that you don't really notice it's actually good for you. 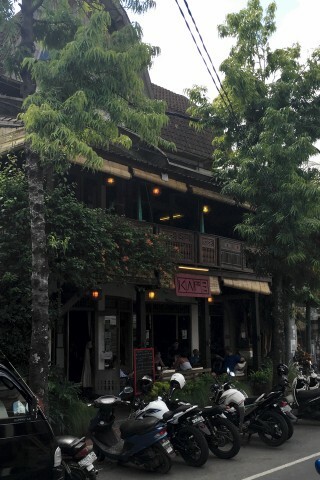 Set over two storeys in a rustic, somewhat rambling building filled with wooden tables and chairs plus raised platforms with cushions, this is a place to chill out over a natural soda, smoothie, extracted juice or a cardamom kopi. The food menu is extensive and enticing, and spreads from breakfast through to dinner and desserts, with a kids' menu as well. Think healthy meets Mexican meets Japanese meets Indian -- this is global cuisine that actually works. For brekkie try the flax and oat porridge or a breakfast burrito, macrobiotic breakfast bowl (each 39,000 rupiah), or maybe a tofu scramble (33,000). For lunch the salads are varied -- try a tricolor soba plate (69,000 rupiah) or a roasted pumpkin, rucola and feta salad (65,000) -- and the bowls, such as saag paneer or vegetarian chilli -- more substantial again. For a proper main, pasta pesto, casher ginger chicken and a clean steamed veggie plate feature. Desserts are scrumptious -- stop by for a slice of mulberry cheesecake, lime meringue pie or some raw chocolate chilli balls (20,000-37,000 rupiah). Add 15% for tax and service to prices mentioned here. The atmosphere is relaxed and you can take away various items like coconut candy and ginger caramels, or maybe some coconut nectar and local jams. The people behind Bali Spirit are responsible for Kafe, and the same commitment to holistic health is clearly evident.